Enjoy authentic Italian gelato in a delectable gelato cake. Our handcrafted gelato frozen cakes and ice cream frozen cakes are all you need to deliver that wow factor at your party. Plan your event. Choose your cake – Pre-Made Gelato Cakes/Ice Cream Cakes or Custom Gelato Cakes/Ice Cream Cakes. And leave the rest to us. All our delicious Italian ice cream cakes are freshly made in house. Crafted with fresh gelato, handmade crusts, decorative glazes and ganaches. We offer gluten-free and vegan options. All fresh and natural ingredients. No additives or preservatives. Only fresh creamy goodness. Enjoy your celebrations with a unique and tasty Gelato Cake. They are an excellent addition to your birthday parties, Christmas, dinner parties, entertaining, or any other event. The gelato cakes are made with our available flavours and based on your specific requests. Select your favourite flavours for a delectable cake that is an intense and happy experience in every slice. Our premade cakes do not come in any standardized flavours. We like to be creative with our blends. Tell us your favourite flavours and we will create your gelato cake made-to-order. Our gelato and ice cream frozen cakes are made with 2 gelato/ice cream flavours of choice. Choose your flavours or leave it up to our chefs to put together a delicious treat for you. Order your artisanal gelato cakes or ice cream cakes at the Perfect Scoop. Call and place your gelato cake order today. 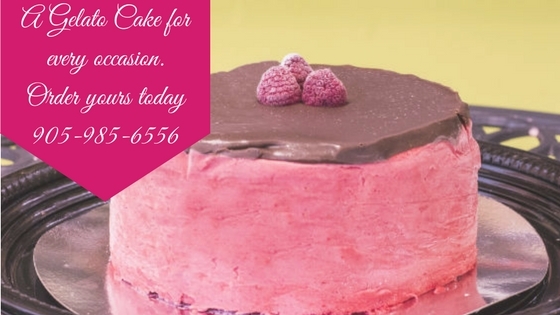 Pre-order your gelato cakes and ice cream cakes for pick-up in store or by calling us at 905 985 6556. Limited quantities of premade cakes available. Custom orders may require 2-3 days.